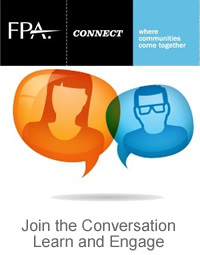 FPA is the community that brings together those who deliver financial planning, those who support it and those who benefit from it. As a member of FPA, you are never alone. You are part of a community of more than 28,000 members, all pulling together for those we serve. We are the heart of financial planning, linking you to educational opportunities, on-line discussions, career enhancement tools, seminars and publications, and more. Have a question or need to contact us? Use the information below to mail, call, fax or email us. Albertus Magnus College offers the only CFP® Board Registered Undergraduate program in Connecticut. Click here for details. Fairfield University offers the CFP® Certificate program. Click here for details. Let the FPA Career Center Find Your Next Employee If you are looking to hire an employee, you will want to visit the FPA online Career Center. The Career Center attracts qualified, professional candidates committed to the financial planning process, and they demonstrate that commitment through their skills, work experience and education. On the Career Center, you can post an open position in your firm, or review resumes of potential employees. The Career Center is one of the most visited areas on FPA's website, so if you are looking to hire a new employee, you will want to take advantage of this member benefit.